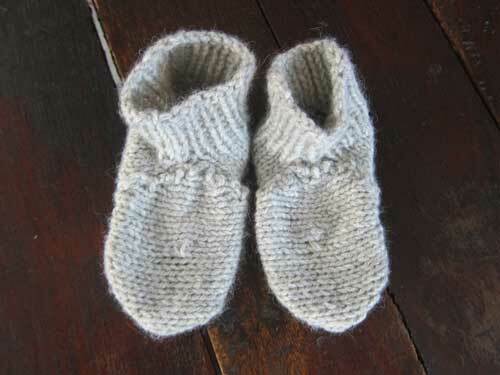 is a quick little project, resulting in a pair of baby booties featuring fun fun fun pom poms. Cupid is knit on dpns in two pieces. The front flap is knit on its side and sewn on. pattern below . . . happy valentine’s day to all! nota bene: we typed up this pattern real quick to make it in time for valentine’s day. if you do find errors, please scribble us a note so that we can amend it accordingly. Clever Camel by Jones & Vandermeer (100% camel; 50g/110yds per skein). The boot, shown in Snowden Grey, utilises about 20g. The pom poms, shown in Poppy, utilize about 10g. size foot length 3.75-4.25”; roughly 0-9 months. Our baby model is 5 months old with a foot length of 4”. pattern notes the sole is knit flat. Stitches are then picked up along the sole to form the heel of the bootie. 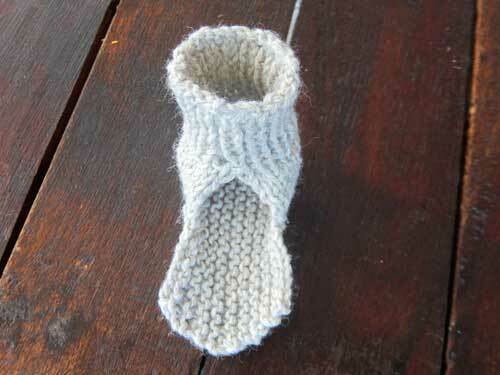 The ribbing at the top of the bootie is knit in the round. 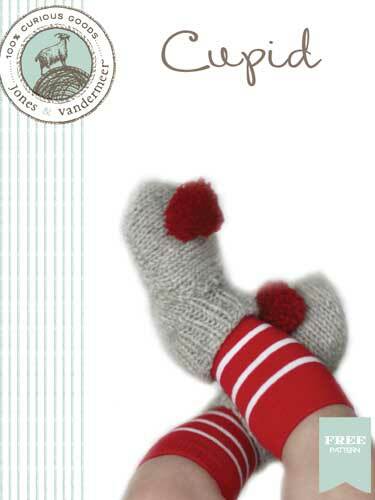 The front flap of the bootie is knit flat, sideways. K1f&b: make 1 increase by knitting into the front and back of the same st.
SSK: slip first st knitwise, slip next st purlwise. 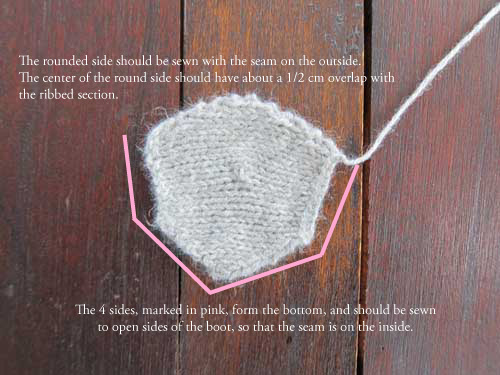 Insert left hand needle into the front of the slipped stitches and knit together. 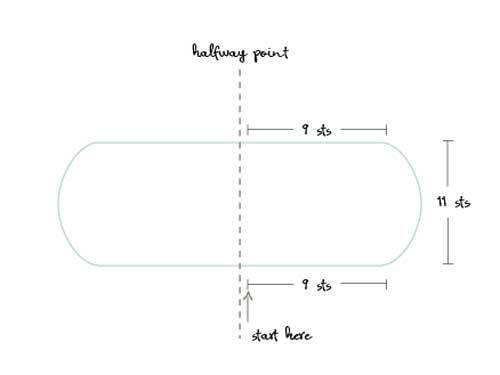 WRAP & TURN: with yarn in front, slip the next st from the left-hand needle to the right-hand needle. Move the yarn to the back, slip the st back to the left hand needle, and move yarn back to the front again. Turn the work to the opposite side. the left & right feet are the same, and the pattern would be repeated again to form a pair of booties. With MC, CO 18 sts, using long-tail method. This section is knit flat. Pick-up 29 sts as shown in the diagram above. Now, divide sts evenly across 3 DPNs to begin knitting in the round. Rounds 9-16: *P1, K1*, rep from * to * until end. CO 11 sts, using long-tail method. This section is knit flat. Row 14: K1, P to end* (*when you get to 7th st that has the 2 wraps around it, you should insert your needle into both the 7th sts and the 2 wraps and knit all three together into 1 st). BO all sts. Break yarn leaving a 2 feet tail. Weave in all ends. Handwash gently in room temperature water. Arrange the booties like the photo below to dry. While waiting for the boots to dry, make two 1.5 – 2” pom poms out of CC yarn (Poppy), using a pom pom maker and following the manufacturer’s instructions. Attach to the front of the booties as shown in the finished sample. we make some of our patterns available for free as a means to raise money for Doctors Without Borders / Médecins Sans Frontières (MSF). if you’re up for it, please consider supporting this incredible organisation! Previous Post‘lil cupidNext Postoff scouting!